5793 labyrinths found. Showing 3841-3860. Sorted by country, state, city, then zip/postal code. Church is located across the street from Gardner-Webb University in Boiling Springs, North Carolina. Main Street is also North Carolina Highway 150. Off Highway 158 in Southern Shores, turn onto Dogwood Trail at Kitty Hawk Elementary School. At the stop sign, turn left onto Pintail Trail. Turn left at the end into the church parking lot. The labyrinth entrance is on the right side of the parking lot. 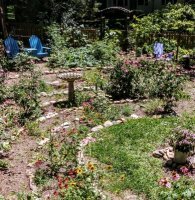 Next to the labyrinth is a Memorial Garden Columbarium in the shape of a Maltese cross. River cobbles, 3-5 inch diameter, delineate the walking paths, the surface is constructed of crushed stoned screenings. Crushed, recycled glass is contained within metal edging to form the turns and the rosette. 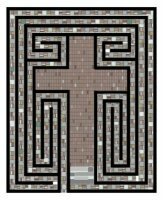 The labyrinth at Saint Peter is an original seven-circuit design in the form of a cross. In the courtyard of Fusions Spa & Wellness day spa. 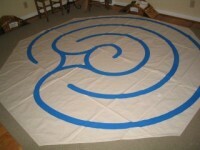 The labyrinth is available to spa clients during open spa hours, see website for details. Although the courtyard is ‘on Main Street’ in our little town, it is within a fenced & landscaped courtyard which will eventually have a gate. 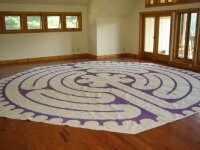 This is an 11-circuit Chartres style stone labyrinth in the mountains near Todd, NC. 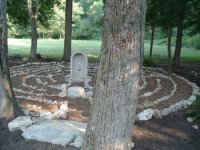 The Labyrinth is located behind Barium Springs Little Joe's Chapel & Enrichment Center. A labyrinth with one path going to the center and the same design (but not touching or crossing except at the center) as an exit path. I suggest you walk in on the gray path - giving God your burdens, concerns, requests for guidance. Spend as long as you care to stay in the center. Leave on the white path - thanking God for your blessings and praising him for his gifts of life and love and more! For use by groups staying on the property or can be booked in advance for a nominal charge. Used during various programs throughout the year. white quartz stone and mulch path. Only available to silent retreat participants. Labyrinth is on private property and is not avaialable to the general public. N 35 42.791'° Lat. ; W 082 29.634° Long. Open to the public the first Saturday morning of every month or by appointment. This is a personal sized labyrinth. brick pavers with granite center engraved with "The Litany of Reconciliation"
At the intersection of Fifth St. and Summit St.